Buzzintown brought to you a lot of exciting events hapening in Bangalore. Whenever you feel to attend any type of event then just come to Buzzintown and get details about every upcoming and happening events in Bangalore and other major cities of India. Buzzintown is one of the most popular event hub where you can find all kind of events like music concerts, Theater and arts events, workshops and seminars, Film festival events, family and kids events, Plays and drama events and so on. Here is the list of most awaiting and happening events in Bangalore. Visit us, buy your ticket and enjoy your event. 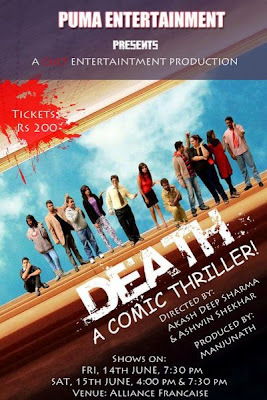 About Death Play: A maniacal killer is out in the open. The police cannot seem to handle it. Hence the citizens take responsibility, and many factions are formed in the city to capture the maniac killer. Klienman our protagonist is a man who likes to work hard and live a normal life, but he gets caught in the rush to catch the maniac . He embarks hesitantly on an uncanny adventure on a cold night to help capture the maniac, but he does not know how! In the process he ends up meeting some unusual characters , some of which are a philosophical prostitute, gay cop and a mad doctor. Will klienman survive the night? will he capture the maniac? come and find out! If you like theater plays, visit us to know all upcoming theater plays in Bangalore. 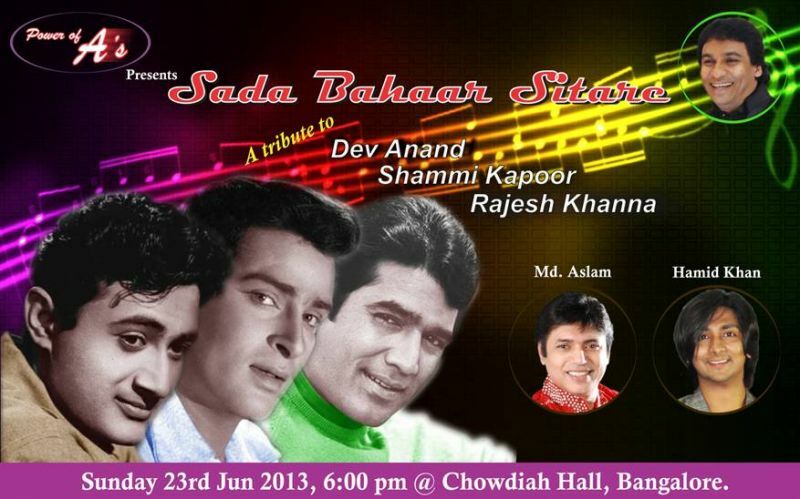 For ardent music lovers of Bangalore Saturday 15th June promises to be yet another memorable golden musical evening. Babloo Mukherjee brings to you Soulful Melodies - 2 featuring Hemant Kumar, Geeta Dutt and Talat Mahmood – Three unforgettable voices of the golden era. Power of A's presents 'Sada Bahaar Sitare' A tribute to Dev Anand, Shammi Kapoor & Rajesh Khanna. Do you love music..? Then follow us to find more Music concerts in Bangalore. Ireboot presents following two workshops, one is Event Management Workshop and second is Stock Trading Workshop. Every wondrous event is powered by the concepts, creativity and dedication of a highly skilled team. Ever wondered what goes behind the screens of a perfect event? Always wanted to bring your crazy ideas to the market? Calling all the magic makers as Mr. Maher Rustomji prepares you for a fast track shot towards event management. A two day boot-camp that teaches you how the nuances of making money using scientific methods that minimize risk. Learn the processes and tricks used by experts. Go through mock trading sessions and follow trends of stocks thereby analyzing them for your benefit. 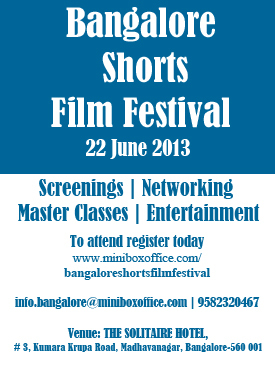 Bangalore Shorts Film Festival is a movement to recognize & popularize the work of young & experienced film makers from across the India & world. The humble journey of BSFF has began in year 2012 to mark the 100 years celebration of Indian cinema & to salute the contribution of the Kannada film industry towards the development of cinema in India. The festival provide platform to aspiring and professional film makers for showcasing their talent with networking & marketing opportunities in film industry. Instead of these given list of events we have lot of exciting events. Be in touch to know all kind of events in Bangalore.